Many people have to make the surprisingly hard decision of which chainsaw to buy. It is because the options presented by the industry are so vast that a person ends up confused. This guide is meant to solve that confusion by presenting a great option; The Remington RM5118R for the users. It is a very capable device excelling in medium duty tasks and even some heavy duty tasks. This Remington model uses innovative QuickStart technology to start up easily without presenting any problem to the user. It utilizes an electric ignition for starting up even in unfavorable conditions. It uses anti-vibration handles to deliver fewer vibrations to the sawyer. The engine is 51cc which ensures the delivery of power and performance to the sawyer so that all types of tasks can be accomplished with this beast. Although it is a bit heavier, i.e. 25 pounds, but it is certainly not unmanageable. The professional grade sprocket and crankcase guarantee years of solid performance without any signs of slowing down. It has been designed in such a way that it is ideal for cutting firewood, tackling storm and yard debris, and trimming medium to large trees. Performance –This model of Remington is famed for its power. It might be a bit heavy as compared to the competition, but its power is phenomenal. It cuts through the wood easily and swiftly. It is a gas powered chainsaw and many people consider gas models to be superior to electric models considering their power. Starting Up – The machine uses a very capable motor that accomplishes the task of starting it no matter what conditions are faced. Although it has an electric ignition, there are no doubts about the performance of this device. Although the motor is a bit bigger, it is for the best because it ensures this vital function. The starting instructions should be followed for optimal start-ups. Oiling – The automatic oiler keeps the lubrication to the bar at a perfect level, which minimizes wear of the device. This also prevents the saw from overheating so that it can operate for longer efficiently. This also prolongs the life of the device substantially. Comfort – The handles of the device are also excellent quality and provide great comfort to the sawyer. They are manufactured as anti-vibration handles which decrease the vibration during operation. Due to the fact that the vibration is caused while working on cutting tasks using a chainsaw and it’s the most common reason the sawyer will get tired. And when this factor gets eliminated, chances are there that the saw will work more easily and effectively for tasks that need more time and efforts. Safety – A safety measure employed in the device is the inertial chain brake which is responsible for stopping the chain whenever kickback energy is encountered by the saw. This is a useful feature for minimizing incidents. Carburettor – In many cases, the carburettor of the device doesn’t perform optimally and must be adjusted. This definitely interferes with the working of the device. Of course, it is not advisable to do the adjustments yourself. Take it to a verified repair shop so that all your problems are solved there. 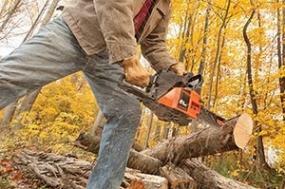 Leakage – Just like countless other chainsaws, this one also faces the problem of oil leakage. This means that the oil needs to be drained every time after use to prevent spillage. For some, this is an easy solution, but for many, it gets tiring and cumbersome rather quickly. Tension Adjustment – Another common problem for the saw to deal with this chainsaw is the requirement to adjust chain tension. It starts off fine but then the tension gets messed up after a while. This can also prove to be detrimental to the health of the chain since it gets damaged when it runs off the blade. This model from Remington tries to stand out among a huge group of capable chainsaws and succeeds as it is surely in the running for one of the best chainsaws the industry has to offer. It features a nice design, constructed by using quality materials to ensure longevity and backed by excellent customer service.